Rogue elements blocked roads, curtailed movement of people, burnt property and looted shops as what was touted as a "shutdown" degenerated into chaos today. The Zimbabwe Republic Police on its Twitter account called on members of the public to identify culprits some of whom were captured on photographs. 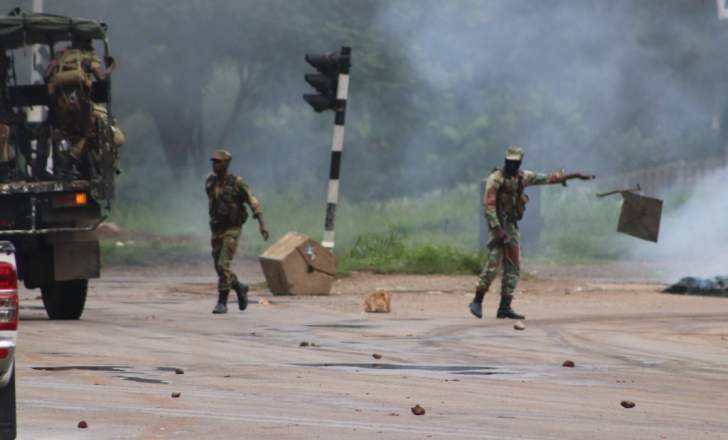 ZRP and and Zimbabwe National Army will soon issue a joint press statement over the disturbances. A survey conducted by the Herald in Harare revealed that at TM Machipisa supermarket, the protesters looted all the goods in the shop. In Mabvuku, Choppies supermarket was also looted earlier in the day. In Chitungwiza at Hunyani Bridge, youths have barricaded the road and are forcing people to pay certain amounts to allow them to pass through. The rogue youths are making each passengers pay at least a $1 each while motorists are being charged $2. Chicken Inn at Makoni Shopping Centre was looted while OK Supermarket was damaged by the stone throwing protesters. There are also reports that along High Glen Road, there were four ‘roadblocks' manned by youths also forcing motorists to pay. A bus was also burnt near White House just after Kuwadzana resulting in police being heavily deployed in the area. Government has warned members of the public against infringing on the rights of others.